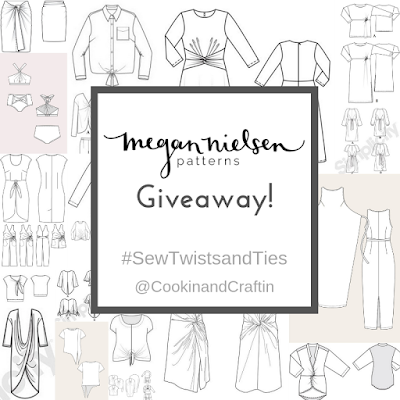 Another pattern giveaway for Sew Twists and Ties! 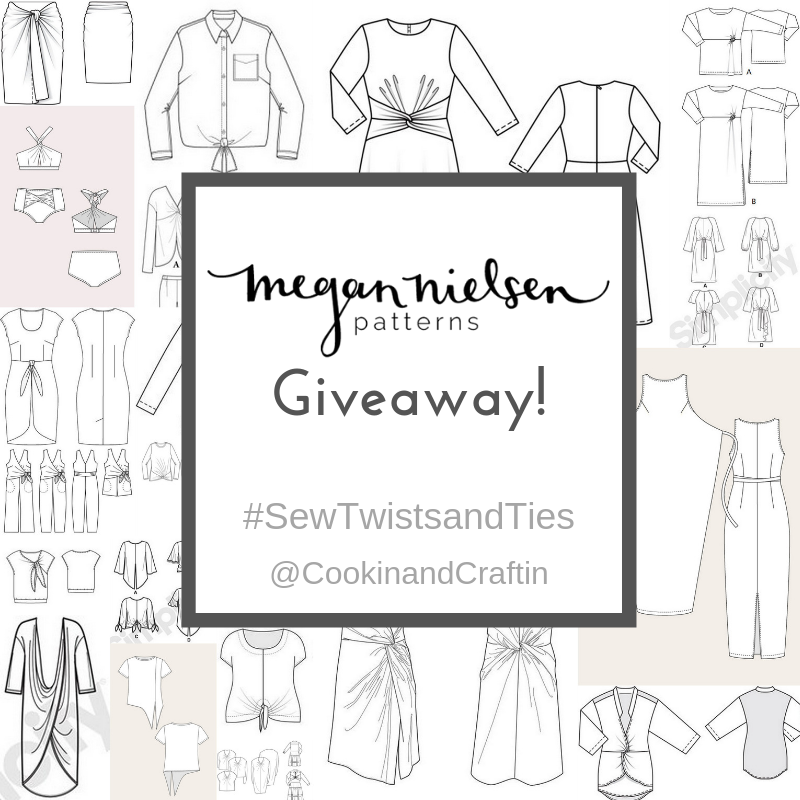 Megan Nielsen was kind enough to donate two twist and tie PDF patterns for my Sew Twists and Ties challenge and I'm so excited! Her Jarrah sweater, which I sewed up a few weeks ago, was one of the patterns that inspired me to start the challenge! I also adore that Megan has expanded the size range for her pattern line... bravo for inclusivity! As part of this giveaway, we're giving away 2 of those PDF patterns, and the winner will be able to choose either of the size ranges Megan offers! First, we've got the Jarrah sweater. Obviously, I quite like this one. Jarrah is a slouchy sweater/sweatshirt with several sleeve, hem and neckline options. The tie version was just too cute for me to resist, so I sewed one up! 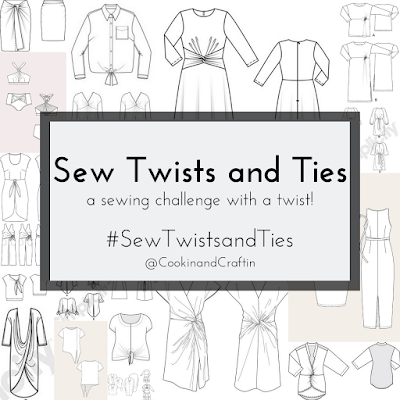 It's been a super popular pattern during the Sew Twists and Ties challenge, too, so there are lots of versions in the hashtag! Also up for grabs is the Axel skirt, which is not lacking in the options department either. Axel takes the form of a pencil skirt with a slit, handkerchief hem, or hip ties... all very stylish. I haven't made this one yet, but don't count me out! Thank you to Megan Nielsen for the gorgeous patterns! Enter below through the Rafflecopter link to win! UPDATE: the giveaway is closed and a winner has been chosen and notified. Not tried a Megan pattern yet but I’ve got my eye on the Sudley dress, the Jarrah would be perfect for this time of year though! I've had my eye on the jarrah for a while! And I love using the rowan bodysuit for swimsuits and rashguards! I’ve been wanting to make the jarrah! I have been thinking about the jarrah. Its pretty cute! My favourite is still the Rowan. But would love to test another. My favorite is the Jarrah. I too love the jarrah. It seems very versatile! My favorite of her patterns is the mini briar. My daughters have several! I'd love to make the darling ranges dress, though. Just not sure if I'd wear it. I'd definitely wear the Jarrah sweater. So cute. The Jarrah looks gorgeous. I have the Dawn jeans on my to-make list too. I really like Jarrah and ❤️❤️❤️❤️❤️ to Megan for widening her size range!!! I haven't made any of them yet, but since the size range has been widened I've had my eye on a couple - including the Jarrah. But the Flint pants also have such a cool tie fastening! I adore the Briar, but I've been wanting that Axel. Want to try the Jarah! I've been wanting try one of Megan's new patterns but haven't gotten around to it yet! I love both of these. I love the flint pants (made 3 so far)! I'd really like to try the skirt! Thank you. I'd love to make the Tania culottes. I really love her jeans patterns and I've been wanting to make a Jarrah too! I like all the patterns, they are so up to date. I have been admiring the Jarrah, but I also adore the Eucalypt tank. I made the Tania Culottes for my duaghter and liked them so much I have been wanting to make a version for myself. I like the Virginia leggings pattern. I really want to try Wattle and Jarrah,love the options! I love my Dove blouses, but my daughter wears her Brumby skirt them moment it is clean, so it's the favorite around here. I haven't made a MN pattern yet, but ai'm excited to try Rowan, Dawn, and this sweatshirt! I love that so many of Megan's patterns are timeless! I love Megan's patterns but have neither of these :-( I would love very much like to try either or both of these patterns. Thank you for the opportunity to enter. I really love the Axel skirt. So versatile! Oh both of these patterns are so nice! The Axel shirt tie is the cutest though. Dawn Dawn Dawn! Which pairs great with the Jarrah! I like the Jarrah sweater and would love to try the jeans. Thanks for the opportunity to enter. I already own the Flint culottes, which you could argue is a tie! They're my current favorite MN pattern (but I'm open to opportunities) :). I'm over my sewing budget for the month so I can't buy any new patterns, but I'd LOVE to win some! I can't stop obsessing over Megan Nielsen's patterns. I am anxiously awaiting spring so that I can whip up some Flint Pants! I am also SO in love with the Jarrah sweater pattern. There are just so many cute options. Plus, I just moved to a city where it's -32°C/-26°F so I really can't have enough sweaters!